After working hard all term, pupils let their hair down today during the annual end of term Christmas Party. The theme this year was to wear a Christmas Jumper in aid of the TextSanta appeal which is helping the following 3 charities: Macmillan Cancer Support, Make A Wish and Save the Children. As you can see from the images, everyone entered into the Christmas spirit and had a great time. Many thanks to the Year 12 pupils that did a fantastic job organising the party. 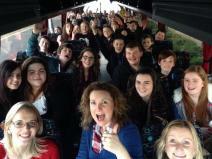 Scripture Union pupils had a great trip to Newry for a film and some shopping. 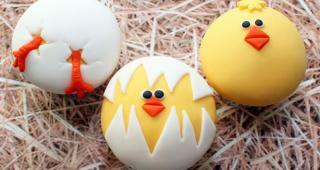 KFC was delicious and subway chocablock! All the SU staff and pupils would like to wish you a very Happy Christmas and a great New Year. 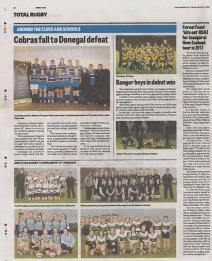 Pictured are the Newtownhamilotn High Under 15 Girls Tag Rugby team in the ‘Total Rugby’ pull out from the Newsletter on Tuesday 15th December. The girls recently travelled to Armagh Rugby Club with Coach Mrs A Laverty to participate in a four team friendly tournament against other schools in the area. The girls put on an impressive performance considering that it was the first tournament for most of them, having just received a couple of weeks coaching from City of Armagh Rugby Club Harry Doyle. The girls displayed fantastic team skills and pulled together to give each opposing side a good match and they finished the morning with a convincing win in their final match. Top try scorers were Hannah Calvin and Kerry-Ann Walker. The girls now have the rugby bug and hope to continue their training at Armagh City Rugby Club on a Monday night with coach Harry Doyle. 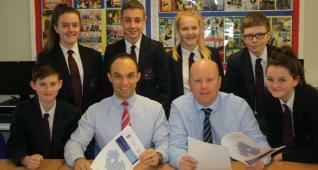 Year 11 and 12 LLW pupils enjoyed a presentation by Teresa Moley from the Equality Commission. She highlighted the role of the Commission and pupils had the opportunity to look at case studies to decide how they would rule on various cases. Pupils realised that there are many grey areas within the law and that the Commission has a very difficult job deciding whether or not claimants have been discriminated against. Teresa wished the pupils success for their Local and Global citizenship module in January and was appreciative of the opportunity to promote the work of the Commission with our pupils. Over 500 people squeezed into the school assembly hall last night for our 60th Anniversary Carol Service. The event featured musical items and biblical readings from the pupils and staff of Newtownhamilton High and our contributory primary schools of Cortamlet, Drumhillery, Kingsmills, Lisnadill and Newtownhamilton. What a wonderful evening for the local and wider community with everyone in attendance having an opportunity to view a number of display and chat about past memories over supper which was served in the school canteen. 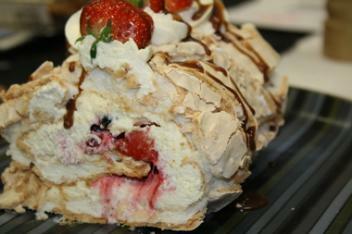 Principal Neil Megaw stated “What a fantastic night which was extremely well supported by the community. I am delighted that our 5 main contributory primary schools were able to join us in celebrating 60 years of education at Newtownhamilton High. 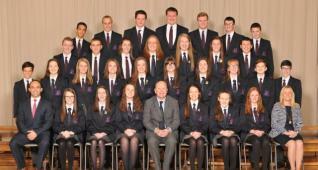 I am also very proud of all our pupils and staff for the contributions that they made. 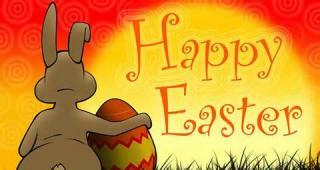 Finally, I take this opportunity to wish everyone a Happy Christmas”. As part of our 60th anniversary celebrations, our School Association Members are selling commemorative mugs priced at £5 each. 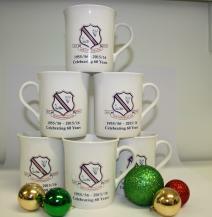 These would make an ideal Christmas present and are available to purchase from the school office. They will also be on sale at our Carol Service tomorrow evening. 09/12/15 - Year 8 Girls - Hitting All The Right Notes! Twelve Year 8 girls travelled to St Paul’s High School, Bessbrook this morning for the first rehearsal of our new joint choir. With 60 pupils in total from Newtownhamilton, St. Joseph’s, St. Paul’s and Newry High Schools, this is a choir which will continue to build the excellent relations between all schools, as part of the Shared Education Programme. 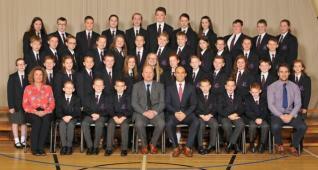 It’s hoped this choir can foster new friendships, as well as nurture pupils’ love of music and performance. The pupils spent the morning rehearsing Rutter’s “The Lord Bless You and Keep You.” All teachers involved were extremely impressed with the pupils’ musicality and their enthusiasm for this new venture. Mrs Graham was particularly impressed with the Newtownhamilton girls who sang the alto line for the very first time! The choir will hopefully perform at numerous events in 2016 – so watch this space! 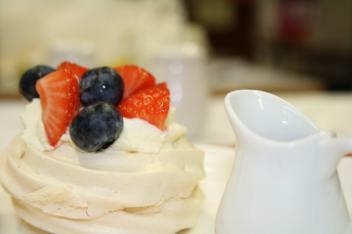 Well done this morning girls – you were certainly in fine tune! As part of our school's commemoration of the Decade of Anniversaries our Year 10 History pupils had the wonderful opportunity to visit the Somme Heritage Centre in Newtownards. The centre examines Ireland's role in the 1st World War with special reference to the cross-community involvement of the 3 local volunteer Divisions: the 10th and 16th (Irish) Divisions and the 36th (Ulster) Division. 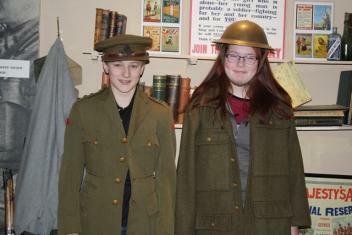 The pupils have been studying World War One in their History and English classes and were all impressed by their visit which brought their studies to life. They got to handle de-activated weapons that were used by both the German and British soldiers and saw the First World War through the eyes of a soldier that fought in it by walking through the atmospheric trench with the sounds of heavy artillery thundering along the way. 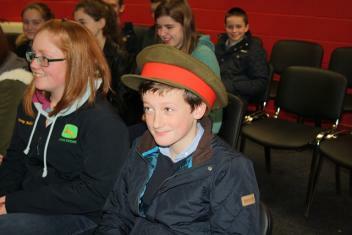 On their return to class all of the pupils will complete an important Communication Task where they will empathise with life as a WWI soldier and write a diary entry or letter home from the trenches. 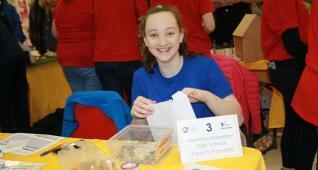 Our thanks goes to Mrs Reid and Mrs Robinson who accompanied the pupils. 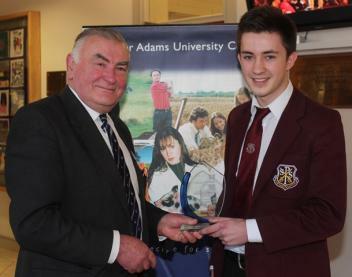 St. Paul’s High School pupil David McNamee was recently selected as the inaugural winner of an award presented by Harper Adams University in Ireland in recognition of his achievement as the top GCSE Agriculture & Land Use Studies pupil in the western region of Newry & Mourne Area Learning Community. GCSE Agriculture & Land Use Studies is delivered in both Newtownhamilton High School and St. Joseph’s High School Crossmaglen to pupils from Newry and Mourne Area Learning Community (western region). David was part of the first cohort that commenced his studies in September 2013 and was rewarded for his dedication to the subject area when he achieved an A grade in August 2015. Newtownhamilton High School Principal Neil Megaw stated “Congratulations to David on his superb achievement. 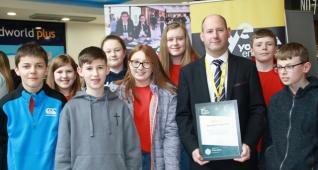 He was 1 of 12 pupils from Newtownhamilton High, St. Joseph’s High School Crossmaglen and St. Paul’s High School Bessbrook that availed of this shared education collaborative course. Sharing courses with collaborative partners means that pupils in South Armagh can select from a much greater provision of subjects that are all delivered in an environment of respect for cultural diversity. We are delighted that Newry High School is now involved in this partnership with their pupils also studying Agriculture and Land Use Studies”. 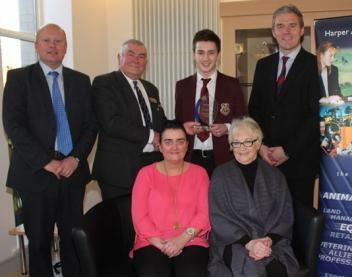 Principal of St. Paul’s High School, Jarlath Burns, thanked Harper Adams in Ireland for donating the trophy and stated “that this award is one of the many fruits of what is an excellent relationship between the two schools, one which in based on friendship and trust. I congratulate David on this achievement and thank the excellent teachers in Newtownhamilton High School for the work which they do for the pupils from St. Paul’s”. 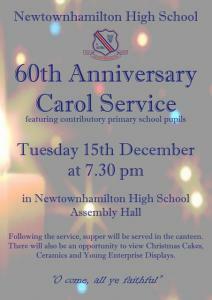 As part of the 60th anniversary celebrations, Newtownhamilton High School is holding a Carol Service in the Assembly Hall on Tuesday 15th December at 7.30pm. This event is open to the whole community and will include musical performances from Newtownhamilton High, Cortamlet Primary, Drumhillery Primary, Kingsmills Primary, Lisnadill Primary and Newtownhamilton Primary. 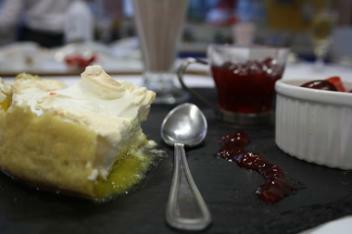 Supper will be provided in our canteen after the service and there will also be an opportunity to view the Year 9 Young Enterprise Display; the Year 10 Christmas Cake Display; a Ceramics Display; and our recently opened fitness suite. 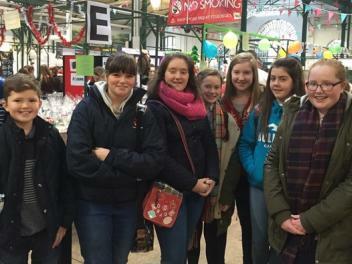 Year 9 recently visited St Georges Market in Belfast, as part of their Employability course, where they viewed the fantastic Young Enterprise stalls. 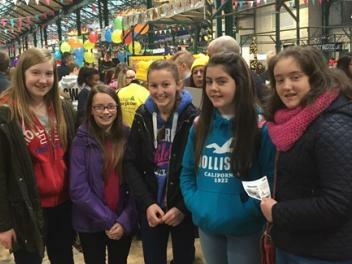 Afterwards they were escorted to the Continental Markets at Belfast City Hall where they revelled in the seasonal festivities and sampled food from the various delicious stalls! 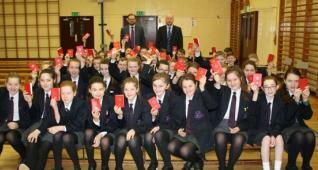 Year 9 thoroughly enjoyed this culturally festive experience and a fantastic time was had by all! 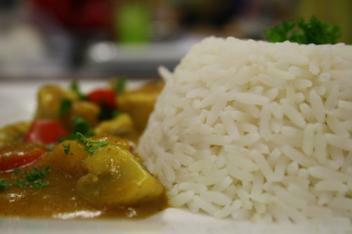 Pictured below are a few images of fine cuisine produced following Year 12 pupils GCSE Home Economics Practicals.